A taste of the third book in the McDougalls series! Hello and happy Wednesday! I hope you are having a wonderful week, wherever in the world you are. I hope your weather is beautiful and you are able to enjoy the outdoors and get lots of reading in! Question for you -- would you like a free copy of The Highlander’s Call? If you love sweet and wholesome romance, are able to review on Amazon, and can post a review within the next two weeks, please respond to this email, and you can become a member of my Sweet & Wholesome Advanced Reader Team. If you have already read Treasures of the Wind, this is the same book, but a sweet and wholesome version. If you’d like to leave a review for either book, I would love for you to do so! The links are below. Wondering if you'll like this book? I've included a taste for you below. Enjoy! 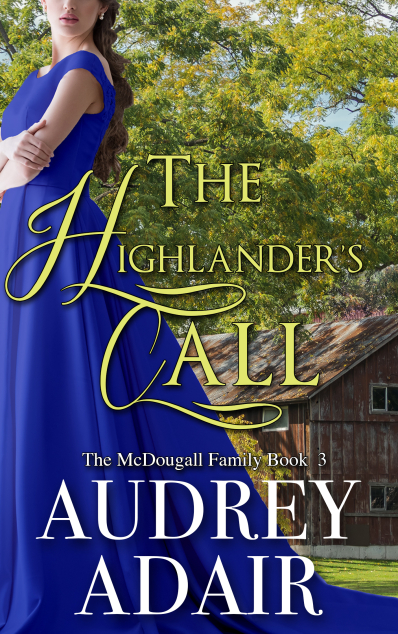 The Highlander’s Call (the sweet and wholesome version of Treasures of the Wind, the third book in my McDougalls series), is now available for pre-order! If you have been waiting for this version and would like to get an idea of my inspiration for the series, be sure to check out my pinterest board here! In the meantime, if you need to catch up, you have two weeks until the book comes out to read the first two in the series, which can be found below under The McDougall Family. I have also finished outlining the fourth book in the series, and I am so excited to write it! I think Roderick may be my favorite brother, and his story is one that will be tons of fun, with lots of sparks between him and his heroine. It will answer his desire for something more while at the same time be primarily set in Scotland, as you all are wishing for. In the meantime, I hope you are enjoying your spring! I have some recommended reads below for you to curl up with as you soak up the sunshine, and a few giveaways with lots of options for you. A couple of the giveaways have a bit of a higher heat level, so just be sure you are interested in the books as described before downloading. As promised, today I have a beautiful cover to reveal to you! This is The Highlander’s Call, the sweet and wholesome version of Treasures of the Wind, the third book in The McDougalls series. It will be coming this month, so watch out for it! What else are you reading these days? I read a fairly wide variety of books but one thing is for certain -- anything I read MUST have a happily ever after. I find there is so much wrong in the world today, that reading is my happy place, and I don’t want to leave a book with sadness. What about you? Are you ok with endings that do not end happily or are you like me? Head on over to my Facebook page to discuss! This week’s newsletter is short and sweet as I have been very busy with family and working away on my upcoming books! I realized that I have been remiss in sharing with you the inspiration for the characters in the third book of the McDougalls story! The steamy version is Treasures of the Wind, now available, and the upcoming sweet and wholesome version will be released May 9th. This version now has a title! It will be The Highlander's Call, and I am very excited to share the cover with you next week. Our hero's inspiration is Robbie Amell, who I first saw in The Flash TV show (yes, I love superheroes). Our heroine's inspiration is none other than Emma Watson, who we all grew to love in Harry Potter but who I loved in her role as Belle from Beauty and the Beast. Did you not love that movie? You can see more inspiration, of course, through my pinterest page. Since this was suggested to me by other authors, I have just loved having a board of all of my research in one place. It is easy to refer to and I love to share it with you. A Book Fair for you! Instead of emailing you on Wednesday this week, I am sending out a special weekend email! The reason is that I am part of a wonderful romance book fair, that is open this weekend only. You can see the link below for more details. Also to note, the first reading suggestion below is free on Amazon. As for what else is happening in my writing world, I am currently working on the sweet and wholesome edition of the third book in my McDougall series. It will be released on May 23rd! In the meantime, I am also beginning to work on the fourth book in the series, which will be Roderick’s story! I love Roderick -- I think he might be my favorite of all the brothers. I have something for the mischievous sort of man. However, I can’t quite decide on where he will find himself…. We know he longs to go west, but at the same time, perhaps he just needs to find the right woman to make him appreciate the Highlands. What do you think? I hope the rest of your weekend is absolutely wonderful! I would so love to know what you think of Treasures of the Wind! It has received many wonderful reviews on Amazon, and currently has a 4.8 star rating! Thank you so much to all of you who have read and reviewed. The story has everything, the initial romance, a self loving pest of a fiancé, some skulduggery, and finally true love conquering all to round it off. There was a delicious tension running through the story - would they get together or wouldn’t they. I read this book in one sitting because it was so unputdownable and I just needed to know what happened. I would recommend this book to anyone. And, starting today, if you like and share my the pinned post on my Facebook page, you have the opportunity to be entered into a giveaway for a $10 Amazon gift card! Lastly, I had the pleasure to be interviewed by Holland Rae for a feature on her blog. I would love for you to read it! The day is finally here -- a brand new story! Thank you all for your patience as you have diligently waited for new work from me. This is the third book in my McDougalls story, and tells the story of Adam and Rebecca Trenton, an Englishwoman who finds herself in the Scottish Highlands. There is a bit of steaminess to this story. For those of you who prefer sweet and wholesome romance, you will have to wait a little longer for that version, which will be released in May. For those of you who enjoy sweet and clean romance, today I have the perfect story for you. The Chieftain’s Duty is sweet and wholesome version of my story Promises of Sunlight from the McDougalls’ series. I love Kyla’s strong independence, as well as Finlay’s loving heart, though he tries so hard to hide it. For more McDougalls, see the books below. For those of you who enjoy the steamy versions be sure to check out The McDougalls, as book 3 will be coming soon. The sweet and wholesome versions are The McDougall Family. I probably shouldn’t admit this, as I make a living primarily off of e-book sales but…. I love nothing more than the feeling of a printed book in my hands. There’s something about the texture of it, the weight of it, that brings me such joy! However, I do find that the majority of books I read now are e-books. I have a subscription to Kindle Unlimited, so there is a lot of value to e-books. They are also delivered immediately to my reader with the click of a button, and are easy to transport -- in fact, I can read from my phone anytime I have a wait! I’m curious -- what do you prefer? Answer through the thread on my Facebook page! And for those of you who enjoy sweet and wholesome reads, don’t forget that next week is the release of The Chieftain’s Duty, the second book in The McDougall Family series! Also a quick reminder that you can enter to win a $25 Amazon gift card through the Love For All Times trilogy contest. I’ve added some page numbers to help you! If you’ve already answered, feel free to go back and revise your answers or re-submit. As I mentioned last week, I love research! In my next novel, the third in the McDougalls series, the majority of the story takes place in the Highlands, of course. However our lovely heroine is a fashion-loving Englishwoman, which means much research on Victorian-era dress had to be done! Of course the Victorian era covers a long span of time, from 1837 until 1901 -- from when Queen Victoria ascended the throne until her death. Focusing, then, on the 1880s, provides some need for creativity as there were actually differing fashions of the time. Dresses were often highly ornamented, with textures, ruffles, and accessories. At the same time, more women than ever before were working and taking part in physical activity, and so required clothing that allowed for movement. The bustle returned in the 1880s, growing from early in the decade until about 1886, before decreasing in size again. The same occurred with skirts -- they were narrow at the beginning of the period, then widening until narrowing once more. Of course, all are rather beautiful -- wouldn’t you love to wear one? Don’t forget that you can enter to win a $25 Amazon gift card through the Love For All Times trilogy contest. I’ve added some page numbers to help you! If you’ve already answered, feel free to go back and revise your answers or re-submit. I hope everyone is having an absolutely wonderful week. I have exciting news to share -- I have just completed my first draft of the next book in my McDougalls series! It will feature Adam, who meets an Englishwoman that completely surprises him. On that note, I know many of you have been wondering what is next in store from me. I am more than happy to share. Here are some tentative dates for my next releases. They are, of course, subject to change, but I will do my very best. March 14 -- The Chieftain’s Duty (Book 2 of the McDougall Family; the sweet & wholesome version of Promises of Sunlight). And after that, well, we will see! I promise to survey you to see what you may be interested in, whether that be more time travel, more Highlanders, or something altogether different! Adam's story has been really interesting to write, with a ton of interesting research. Our time period, the 1880s, is when electricity began to become more commonplace, and I have had some fun with it. At that time, power plants were just beginning to come into being in London. They burned coal to power steam turbines. Electricity was also beginning to arrive in some of the Scottish cities such as Edinburgh. I am excited to share more with you in my coming book! Don’t forget that you can enter to win a $25 Amazon gift card through the Love For All Times trilogy contest. I’ve added some hints to help you find the answers! If you’ve already answered, feel free to go back and re-submit. I hope you are all having a wonderful day full of love -- with a significant other, with family members, with friends, or with your favorite book hero. We’re going to avoid the rush of the Valentine’s Day crowd and spend the evening at home. Likely I’ll end up curled up with a good book by the end of the night! Question for you! How well do you know your Love For All Times? If you have read all of the books, answer the questions in our trivia contest! Check it out here or through the link below. Everyone who responds correctly will be entered to win a $20 Amazon Gift Card. As I know some of you have come to my newsletter for sweet & wholesome reads while others enjoy the steamier books, the weekly recommendations are now separated for you. Please still take a look at the description of the book to make sure it suits your taste. Have a wonderful day full of love! Are you loving the trilogy? I hope you have all enjoyed the Love for All times trilogy! I would love to know what you think. Who is your favorite couple? Answer on my Facebook page! And while you are there… if you like and share my new release post about the box set, you will be entered to win a $15 Amazon gift card! Not only that, but next week we will have another contest. It’s a fun one which will include answering some trivia questions about the trilogy. If you have read the three books, I do have a favor to ask you. I would so appreciate you heading over to the Amazon sales page and leaving a review. Thank you so much! Haven’t read the Love for All Times trilogy yet? Now is the perfect opportunity! Today I am releasing the three books as a box set! And for one day only -- today, January 31 -- they are available for only $0.99.Take advantage and download now! The books have been slightly edited and revised, but if you have already read the three of them, they have not been significantly changed. In every genre of fiction, there are particular “tropes,” as we call them -- familiar storylines that readers enjoy, but are told in different ways. So a guilty pleasure of mine is superhero shows. I love movies and TV shows of vigilantes and heroes wearing capes. Recently in one of the shows, a character is wrongfully accused of murder. He’s innocent, of course, but I can see that this is going to drag out alll season line. I do not enjoy the wrongfully accused storyline at all -- never have. This made me think, of course, about books and my own writing. In historical romance, there are familiar tropes or storylines. My personal favorite (perhaps you can tell if you’ve read some of my books), is marriage of convenience. I don’t enjoy secret identity tropes when they go on far too long and no longer serve a purpose. Are there any you enjoy, or some that really bother you? Head over to Facebook to continue the conversation! Coming Soon … a box set and more McDougalls! Thank you so much to all of you who took the time to share your thoughts with me last week! I had asked which story you would like to see next in The McDougall series, and you have spoken -- Adam’s it is! I will also take into account your penchant for Scottish stories over any other, which I will keep in mind for the future. 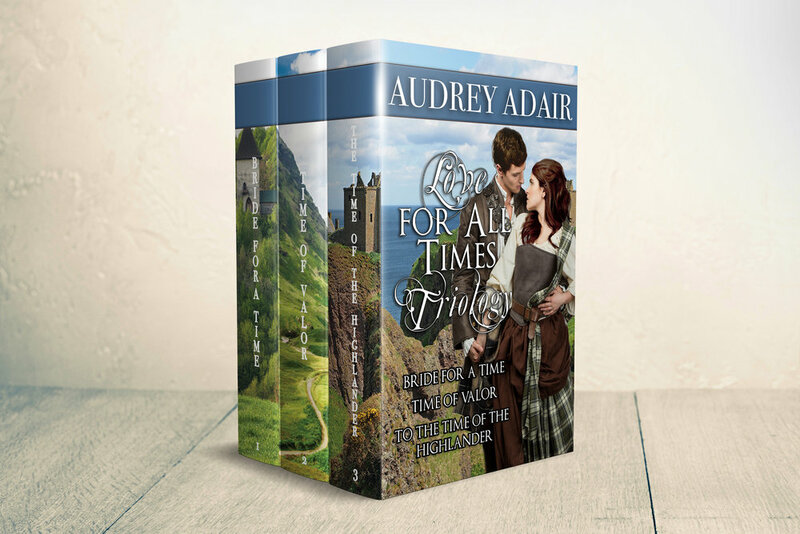 Before Adam’s story, I will be releasing Love for All Times as a box set, followed by a sweet and wholesome version of the second book in The McDougalls (Promises of Sunlight). Then will be time for both a steamy and clean version of Adam’s story! The box set will be released very soon, and with it will be a giveaway for an Amazon gift card, so stay tuned! 2018 is waiting for you! Resolutions. The word has all kinds of connotations. Do you make the same resolution year after year? Does it make you think of failure? Success? New beginnings? In 2017, I fulfilled my lifelong dream of publishing historical romance novels. I cannot wait for this year to unfold, as I take the opportunity to tell more stories and reach a wide number of readers. I hope you all dream big. Determine what you want, what you need right now, and reach for it. I would love to hear from you -- what are your resolutions for the New Year? What are you most look forward to? The Scot’s Vow is ready for you! For those of you who enjoy sweet and clean romance, today I have the perfect story for you. The Scot’s Vow is the wholesome version of my story Hearts of Starlight from the McDougalls’ series. It’s the perfect mix of Highlanders, strong British women, the west, adventure and, of course, romance. If you enjoy it and would like more sweet versions of my stories, please let me know! I have taken a bit of a break for Christmas, but in the new year I will be back with another new release. I have one quick favor to ask. If you had enjoyed this book, or any others of mine and have not left an Amazon review, I would be very grateful if you could do so! You can find links to all of my books below. And finally, I would like to let all of you, my readers, know how much I appreciate each and every one of you. Have a very Merry Christmas and Happy Holidays! This week I’d like to reveal the cover of The Scot’s Vow! Many of you have already read this book as Hearts of Starlight. This is the sweet and clean version of that book, and the cover was just so pretty I couldn’t wait to share it with you. If you or anyone you know prefer books without much steam, then this is for you -- it will be released December 20th! I also have a few reading suggestions for you this week. The first is a freebie for you!